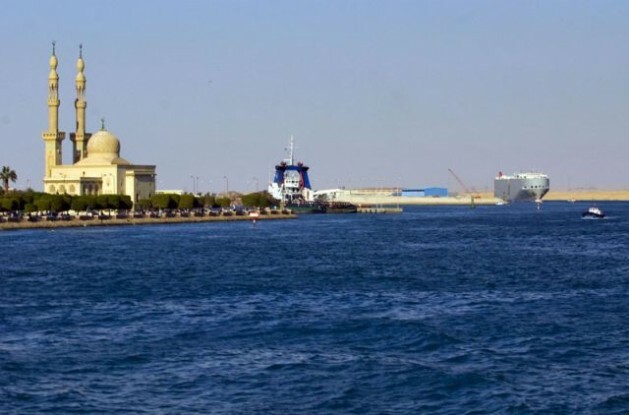 CAIRO, Aug 3 2015 (IPS) - Ships at sea around the world will blast their horns on Aug 6 to mark the re-opening of the world-famous centenarian waterway in Egypt, local officials there say. “Food will arrive faster. Medicine will arrive faster. Petroleum products will arrive faster,” proclaimed Suez Canal Authority head Admiral Mohab Mohamed Hussein Mameesh. The “new canal” – constructed parallel to the existing one – will allow ships to pass by each other, like a two-lane highway, as opposed to a single lane. Upon completion, more ships will fit inside the canal at the same time, reducing the wait time for some ships from 22 hours to 11 hours. “Ships manufactured today are enormous,” said Mameesh. “Our current capacity is just eight ships per day. If there are nine ships, one has to wait outside the canal.” With the expansion, the Canal Authority expects to capture over 13 billion dollars a year in toll fees by 2023, or more than 5 billion dollars over what the canal now earns. But critics of the refurbished canal see it as an attempt by Egyptian President Abdel Fattah Al Sisi to shore up support for his government amid continuing economic problems in Egypt. “[There are] questions about the merits of the overall project. The country is still in a very difficult situation, with population growth high, economic growth low, and where inflation remains high, in addition to a more politicized population,” said Angus Blair, chief executive of Signet, a Cairo-based regional forecasting consultancy firm. Others have suggested Suez Canal may not need an upgrade. “I don’t understand the logic of this Suez Canal expansion,” said Robin Mills, head of consulting at Manaar Energy in Dubai. “On the oil side, the canal’s importance is likely to wane as European Union oil imports from the Middle East fall. As for liquefied natural gas, the existing canal can already take the largest LNG carrier. Even if successful, it may not be enough to improve the lives of average Egyptians, who are suffering rising poverty and prices, as the economy tries to recover from the financial and political turmoil between 2011 and 2013, said Naval History Professor Andrew Lambert, of King’s College in London. The consultants are partners with the Egyptian Army through the Armed Forces Engineering Authority, according to the Reuters news agency citing army and government sources. The original 101 mile-long canal, which connects Europe and Asia, took ten years to build in the 1860s at great human and financial cost.